Our luminous, silky shampoo formula blooms with a fresh, floral scent of chamomile flower & sweet honey, bringing to life our wholesome care that illuminates dull hair, exclusively at Walmart. Massage into wet hair, lather and rinse thoroughly. Follow with our Illuminating conditioner. "AQUA / WATER / EAU SODIUM LAURETH SULFATE COCO-BETAINE GLYCERIN SODIUM CHLORIDE CI 19140 / YELLOW 5 CHAMOMILLA RECUTITA FLOWER EXTRACT / MATRICARIA FLOWER EXTRACT COCAMIDE MIPA SODIUM BENZOATE SODIUM ACETATE SODIUM HYDROXIDE POLYQUATERNIUM-10 SALICYLIC ACID MEL / HONEY / MIEL MALTODEXTRIN LINALOOL BENZYL ALCOHOL ISOPROPYL ALCOHOL CARAMEL CITRIC ACID HEXYLENE GLYCOL HEXYL CINNAMAL PARFUM / FRAGRANCE F.I.L. D207635/1"
Rated 4 out of 5 by TessM from Love this Shampoo! I am totally hooked on this shampoo. Makes my hair shine and so soft! My problem is I cannot find it anywhere now. Please don't tell me it is discontinued! I have looked at every WalMart and even tried to order online and everywhere says it is out of stock! Even the Garnier website says out of stock! Rated 5 out of 5 by Candy97628 from My new shampoo I googled ; Faberge organic shampoo" made in the '70's and a review stating how much your illuminating shampoo with camomile flower & honey extract works and smells so close to the Faberge organics shampoo. So I started looking for your shampoo. I used Faberge organic shampoo from the time I was 12 until age 30 and couldn't find it anymore. I have been looking for a shampoo that was close for 25 years now. Finally my search us OVER thanks to your illuminating shampoo with camomile flower & honey extract. I have only used your shampoo twice and I can tell a huge difference. My hair is looking like it used to after only two times. Thank you so much for this shampoo, I won't use anything else but your whole blends illuminating shampoo with camomile flower and honey extract. Your shampoo has brought life & health back to my hair. Rated 5 out of 5 by KaylaBee from Dude this stuff smells amazing I just bought this product and the matching conditioner and they are gentle on my skin, I have very sensitive skin so I am always looking for products that are gentle but still smell nice, which is hard to find. Yet, this product really did it. It smells super good STILL and its been almost 2 days since i last washed it. I love it. My hair is also very soft so thats good. Rated 5 out of 5 by SuperMegs28 from Sweet Smelling and Clean Feeling! This product smells good and made my hair feel shiny and clean, without any greasy residue! It was a bit unusual to get used to less suds but my hair looked so healthy and clean after using this product for a week! It was a hit with my daughter as well! Rated 5 out of 5 by countryducky from Liquid Sunshine In A Bottle! First of all, I'm super picky when it comes to hair care in general. 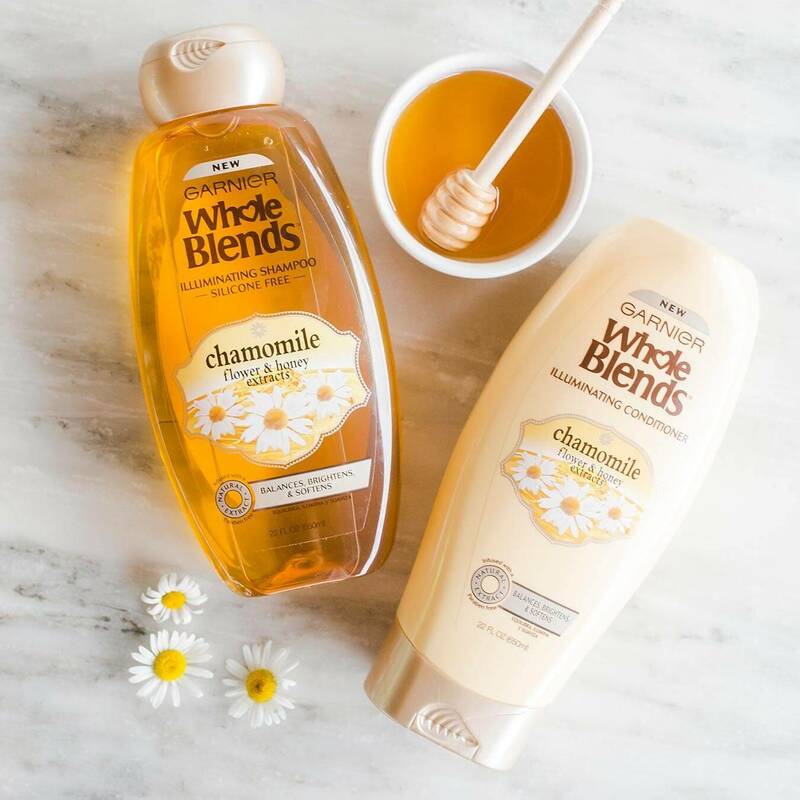 When I read how Garnier Whole Blends created a silicone-free formula, bursting with the combined scents of the wholesome relaxing chamomile flower and sweet honey, that was gentle and promised to bring my dull hair back to life, I was honestly skeptical. For the record, I have thick, coarse hair that can never decide if it wants to be truly curly, and if it had a mind of its own, would be perfectly happy if it was it constant appearance that I stuck my finger in a light socket. Needless to say, messy buns are my go-to hair style. I truly put this shampoo through its paces, washing my hair with it and the matching conditioner every single day for two weeks straight. My hair is amazing. I can't stop running my fingers through my silky, now happy hair! I am truly amazed! Rated 3 out of 5 by ninjarai from Gets the job done. I tried this shampoo after using strict professional salon products for the past 3-4 years. I was very skeptical to use something I could buy in a grocery store. However the experience has been a mildly pleasant one. My hair is still in healthy condition and I'm becoming more accustomed to the smell from the shampoo. Initially the smell from this shampoo was so strong I started to cough. I'm not sensitive to smells at all. Once the smell faded a little bit I loved the strong smell of chamomile and how it reminded me of the herbal greenhouses I would visit with my Mom. There is a hint of honey smell in there but you have to look for it. I noticed after blowdrying my hair that I could still smell the shampoo but it wasn't as nice as when you're initially using it in the shower, it has a bit of a weird chemical smell to it after your hair dries. However per my surprise, it didn't strip all the moisture from my hair. My hair is clean and feels healthy, unlike if you use a really really cheap shampoo that takes everything good and bad from your hair. In short, if you can handle strong smells I would recommend you give this shampoo a shot. Rated 5 out of 5 by shinobree from My hair approves Finding shampoos the work I'm naturally thick ethnic hair is a challenge. Retaining moisture well adding vital minerals back into the hair is extremely important. Garnier Whole Blends Chamomile Flower & Honey Extracts helps promote healthy hair growth. 1) The scent is amazing. The chamomile & honey blend so well together (I got so many compliments on the way my hair smelled) 2) The lather is great. There will not be any weird flim like residue coating your hair. Also your hair will fell well moisturized. 3) The natural oils of your hair will radiate. Leaving you with natural shiny hair. 4) Your hair will be more manageable (easier to style). 5) your hair will look and feel noticeable different (for the better) (I got so many compliments on how pretty and healthy my hair looks). Rated 2 out of 5 by rebmanodraer from Grandma's house I'm not a fan of this chamomile flower & honey extracts shampoo or conditioner. I didn't notice any benefit to my hair. It was tangled and my husband said I smelled like "every grandma's bathroom smells."